Located 80km from Queenstown, this family run, single estate property, creates exquisite, award-winning wines from Pinot Noir and Riesling grapes. 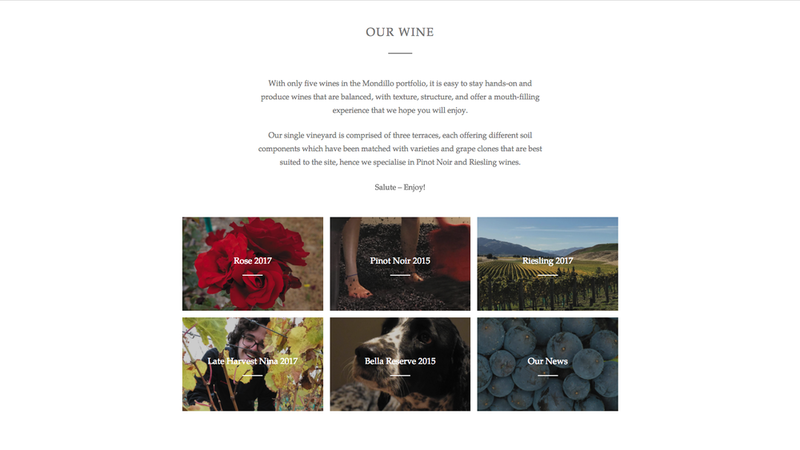 Mondillo approached UpShift to create a Shopify based online channel where it could sell its wines direct to the consumer, but that also retained the unique style and visual language the vineyard has developed over the years. Shopify is a fantastic online retail platform, but is often a little too direct and dare we say bland. UpShift has experience coding into existing Shopify templates to make them much more engaging and unique - a skill we applied to the Mondillo website. When combined with strong imagery, well-crafted copy and an eye on a seamless user experience the end result is as strong in function as it is in style and branding.